Going Home doesn't faff about and jumps straight into the action with only little moments reserved for flashbacks. There was denying that the Peter Pan storyline had been going on for a little bit longer than it needed too but the direction the producers with her fate weren't predictable. And no one in Storybrooke is safe as a new curse, unleased by Pan, promises to one of the biggest game changers that the series has ever given us. Throughout this episode, Robert Carlyle gives a top notch performance as Rumpelstiltskin. His character has come so far since the beginning where all he wanted to do was off Henry and save himself and his transformation from villain to hero has felt completely genuine. Because of that change he makes the ultimate sacrifice and breaks all of our hearts! He certainly got a memorable final moment in taking out Pan and it was a satisfying way of getting rid of the powerful being, even if it is only for a few episodes. His final line was great, "villains don't get happy endings" but I bet it will be overused in the future. Even if the characters think he is dead for now, I doubt it will be the last time we hear from him. Even if he doesn't come back, we get plenty of flashbacks. I was surprised to see Jared Gilmore giving a fairly good performance for once as both Pan and as Henry. With playing Pan, he had to put so much more into it than just optimism and it gave a chance to see him get to stretch his limited acting skills. Yes, you heard it right, I though Gilmore was quite good here. But one thing that didn't add up was the Shadow. We know how frightened everyone is of it and rightly so but how were they able to destroy it in a matter of seconds? And was fire really all it took? Also, his death brought back the Blue Fairy? I can understand why she came back but she wasn't a likeable character in the first place and probably won't get many more moments in the series. But the new curse was great and it really appeared like the producers had thought it through with great care. It is a great sign of how far the show had come after the first two seasons. To begin with, I thought they were going to the old trick of stopping whatever pan had managed to unleash and then all hug and get on with their lives. But it quickly becomes apparent that this isn't going to happen. There is no stopping it. And making them all go back to the fairy tale world was fascinating and it will be interesting to see how it changes who each character is. It leaves plenty of questions to answer in the rest of the season. The farewell scene at the end felt a little too built up in a way that forced you to feel sad. It was obvious that Storybrooke wasn't going to be gone for good or that there was any real permanence to the new curse. 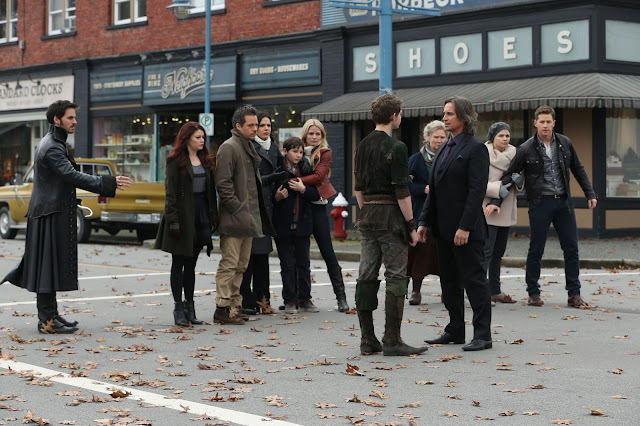 But the feelings were there and it took Henry and Emma a long time to say goodbye properly to everyone. It was nice to see that Regina was willing to give them new memories and how, the end, she got to do what was best for her son. We then a little jump forward in time and it was a smart decision. We know that Emma and Henry have settled nicely into their new life in New York. But the leap in time also served another reason. Gilmore is growing up and he needs a reason to explain why he looks older.